10 will win Three fall themed throw pillows worth $69.97. 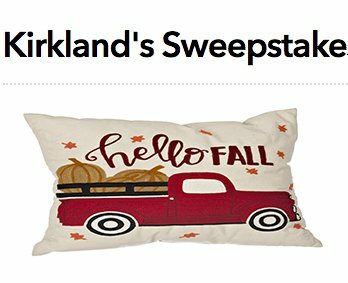 ​Enter for a chance to win a bundle of three Fall-themed throw pillows from Kirkland's! 4 winners will each receive a $120.00 Arts & Crafts storage cart and assorted accessories. Fill in the fields now to get a issue of Woman's Day and be automatically entered for your chance to win. 4 will win a VIP Tour and Sonoma-style picnic for two at Benziger Family Winery in Glen Ellen, CA worth $300.00. Complete the form to enter.